Add-on products transform a project from a core purchase to an all-inclusive experience. This is an ideal opportunity for kitchen designers to exceed customer expectation by offering a superior level of service. Within a kitchen setting, add-on items are almost always required for functionality, so great for selling as a package. Häfele have a wide range of add-on products. 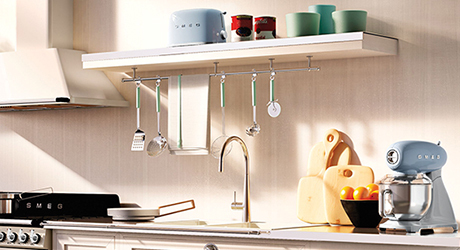 We take a look at lighting, storage and appliance products that are ideal for spring. When it comes to lighting, consumer attention has transitioned away from drama and statement, towards subtle and sleek. With smart solutions key to the lighting plan in any project, the LED lights in our Loox lighting range meet this demand and take it one step further, combining super thin design with innovative ‘Plug and Play’ technology. The Loox ‘Plug and Play’ technology holds intelligent drivers at its core, providing different numbers of lights with the power required. They are also suitable for different voltages and frequencies all over the world and are recognised by different types of switch. This technology sits within the ultra thin profile design of the Polar XS. This ultra thin light can be surface mounted under or inside cabinets, depending on the demands of the project. Available in a super sleek aluminium finish, the Polar XS comes with a 2.0m lead and Loox 24V connector. This superior offering is an essential finishing touch for any project. Consumer demand in kitchen storage solutions has recently seen a shift, with space optimising open shelving taking preference over the bulkier traditional solutions. We have seen the dual function of storage and style encapsulated by open shelving, allowing for designated placement of belongings that can be showcased as necessary. Open shelving also offers compliments open plan living, and the development of single, multi-functional living areas. With this interior design choice set to develop further, alongside the rise in compact living, open shelving is the add-on product that ticks all the boxes. Nice-to-have small kitchen appliances remain popular add-on products for any chic kitchen design. With the option to mix-and-match, small appliances offer versatility, and add stylish finishing touches to projects. Häfele offer a suite of Smeg Small Appliances to provide you with maximum choice when it comes to providing add-on products, in line with consumer preference. The Smeg Coffee Machine is the ultimate add-on product for a consumer who prioritises design but doesn’t want to blow budget. This is one of the most popular products to join the Smeg Small Appliances range, available through Häfele. With 15 bar professional pressure, 3 filters and available in a range of colours, the Smeg Coffee Machine offers statement style with ultimate function. To find out more about our range of add-ons, call our Sales Team on 0800 171 2909.